what a fantastic summer of cricket it has been in England! one of the best I must say! English summer of international cricket started with England’s two match Test series against pakistan. First Test began on 24th May at Lords and eventually the visitors won it to take 1-0 lead in the series. Then England won the 2nd game successfully ending the series in a draw 1-1! Thanks to Jos Buttler’s crucial half century and debutants Dom Bess and Sam Curran’s heroics. I must say the decision of calling back Jos Buttler to the Test squad really worked! Thanks to England’s new selection committee and chairman Ed Smith. Then our lads played one off ODI against Scotland which Scotland won by 6 runs! leaving what happened there with Scotland, the boys started preparing for their ODI series against Australia. England won the ODI series 5-0! It is England’s first ever 5-0 whitewash over Australia in any format! and so many more records were made in that series but one record that I would like to mention here is from the 3rd ODI at Trent Bridge where our lads Went on to break their own record of highest ever ODI score of 444/3 made at the same venue against Pakistan in the 3rd ODI in 2016. They made 481/6 which is now the new highest ODI total in men’s cricket history. Then they won the one off T20I to win the whole series 6-0 and what a game it was where Jos Buttler hit the fastest ever T20I fifty for England off just 22 balls surpassing Ravi Bopara’s 23 ball effort against Australia in 2014. As Australia series concluded all the eyes were on India’s Tour of England. England had won the series previously when India toured England in 2014 and then England had to face defeat when they toured India in 2016 and so the hosts were desprate to win this time. England were scheduled to play three T20is, three ODIs and five Tests against the visitors. The series started with the 1st T20i at Emirates Old Trafford in Manchester and it was all dominated by the Indian bowlers! 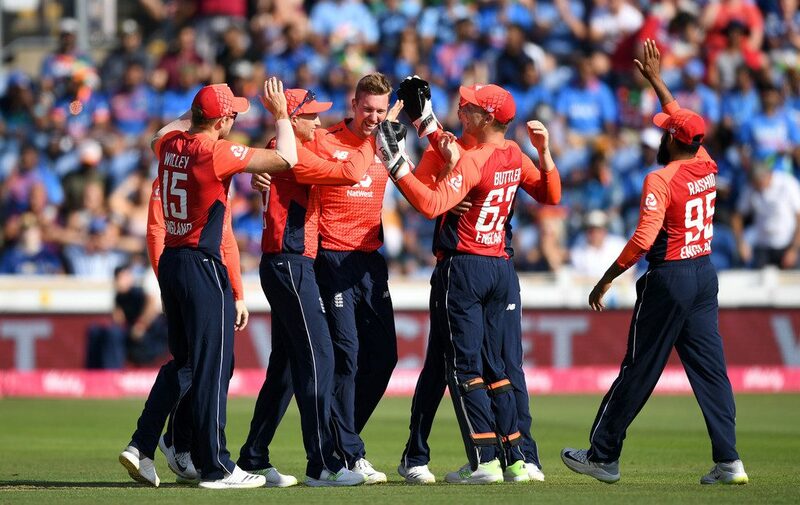 inspite of half-century from Jos Buttler and crucial knocks from Jason Roy and David Willey, the hosts couldn’t make it to win the game as India’s Kuldeep Yadav spun his web around as he scalped five wickets to stunn the hosts! he was then well supported by KL Rahul, Captain Virat Kohli and Rohit Sharma who chased down the total of 160 set by the hosts. India won the first T20i by 8 wickets to take 1-0 lead in the series. Then England won the 2nd T20i and successfully leveled the series 1-1 continuing their winning streak of T20Is at Edgbaston. But at the end it was the Indian team who won the deciding T20I at Bristol county ground to take the series 2-1. The ODI series also ended in kind of same result but this time it was the hosts England who won the series. India won the 1st ODI to take 1-0 lead in the series, once again Kuldeep Yadav played his magic trick but then the hosts made a terrific come back in the other two games two take the series 2-1! Joe Root got back-to-back hundreds in both the games and the bowlers too did an awesome job to take the victory. Our Boys celebrating their ODI series win..
After the ODI series which completed England’s limited overs summer, the preparations for the Test series began. Five Test Matches between two world class teams!! It was all going to be super exciting! And it happened to be the most emotional series to be involved with like Stuart Broad said! for both the sides! both teams were at their best through out the series but in the end it was the hosts i.e English side who won the series 4-1! six weeks! two teams! 5 Tests and one champion! The first Test began on 1st August which was the 1000th Test for the Englishmen. England won the first two tests to take 2-0 lead in the series and just when they thought that they could seal the series in the 3rd game itself, but India made a strong comeback in the 3rd game at Trent Bridge to win the game and reduce England’s lead to 2-1! it was a well fought game tho where inspite India dominating from all departments England managed to take the game to day 5 which could’ve easily ended on day 4! Jos Buttler got his maiden Test hundred a crucial one along with Ben Stokes who got crucial fifty as they both went on to set new partnership record! Then again the English side dominated in the remaining two games to take the series! the fifth and final game was all about Alastair Cook as he announced to retire from international cricket after the series! and Cooky had dream farewell! he got his 33rd Test hundred in his final game! and as he raised his bat for one final time, looked towards the sky and then to the stands to his family, he received a standing ovation from the crowd and applause for good couple of minutes! Skipper Joe Root too got his 14th Test hundred in that game along with Cooky! it was like a cherry on the cake for the hosts! England won the fifth Test and what a moment it was!! the crowd applausing and the Barmy Army singing ‘ALLY ALLY COOK’ as Cooky waved at all of them while he walked back for one final time! Cooky waving the crowd while walking back for one final time.. Pic credits : Getty Images. Jimmy Anderson the most prolific pacer in Test cricket found it difficlut to bid adieu to his good mate.. a teary eyed Jimmy said ‘ he is my good mate and I will miss him around in the change room’..
Best Mates : Jimmy and Cooky..
Alastair Cook was named as the Man of the Match in his final game and Sam Curran and India Captain Virat Kohli were named as the Man of the Series from England’s and India’s side respectively. So that concludes our International summer..
Now lets a have a look at a few records that were made and broken by our boys in the Test series..
Joe Root became the first English Captain and third overall to win all five tosses against India. Rooty has now won 71 per cent of tosses in his 21 Tests as captain. He got his 14th Test hundred in the 5th Test at the Oval! He got this ton playing in his 74th Test Match! He got his 13th Test hundred exactly a year ago in August 2017 in the day/night Test against the West Indies! Joe Root became the quickest batsman to complete 6000+ Test runs in terms of time from his debut. He got to the landmark in five years and 231 days of his Test career. He surpassed former captain Alastair Cook’s mark of five years and 339 days. He achieved this feat while playing in his 127th Test innings. It’s his first century in first-class cricket for 50 months. He is England’s 166th Test centurion and registered England’s 858th Test century. This is the sixth Test hundred in the 4th innings of a Test at Nottingham and second by an English batsman. Graham Thorpe is the first Englishman to achieve this feat. Jos Buttler while playing left 24% of the deliveries he received which is the highest percentage in England’s last 30 Test centuries. Buttler’s this hundred is the first by a member of England’s top six in any of eight Tests they have played this year and second of the series for England after Chris Woakes brilliant knock at Lords in the 2nd Test. His knock of 106 is the highest individual score of the match. It’s his highest individual Test score as well. Before Buttler only Jack Hobbs and Graham Gooch had scored as many 70-plus scores as Jos Buttler (which is 5) before scoring maiden Test hundred for England. He combined with Ben Stokes to produce the largest fourth-innings, fifth-wicket partnership in England’s Test history. They put on 169 runs beating the 163 runs stand between Trevor Bailey and Willie Watson against Australia at Lords in 1953. He also completed 1000+ Test runs. He has scored four test fifties (including those two fifties that he got against Pakistan) and a fantastic maiden Test hundred this summer. Ben Stokes became 3rd fastest cricketer to achieve the Test double of 2500 runs and 100 Test wickets as he reached the landmark when he bowled out India’s Dinesh Karthik. He is the eighth Englishman to achieve this feat. He also became third fastest in world cricket to reach the landmark. The all-rounder achieved the feat in his 43rd Test. Woakesy got the opportunity to play in the 2nd Test at Lords as he replaced Ben Stokes as he missed that game because of his court trial following last year’s Bristol incident. Chris Woakes got his maiden Test hundred. He surpassed his previous best score of 66 that he got against Sri Lanka at the same venue in June 2016. He also completed 1000+ Test runs in the process. He is the 10th player to feature on both the batting and bowling honours board at Lords. Sam Curran became the youngest English fast bowler to take three wickets in a Test innings in England, at the age of 20 years and 60 days! Sam Curran’s 272 runs in this series is the second highest for an England player batting at number eight or lower in a series, behind Moeen Ali’s 293 against Australia in 2015. He is only the second player to score 250+ runs and take 10+ wickets in a Test series before turning 21. He is the first English player (and 27th overall) to score a fifty and have a four-fer in his career before turning 21! He is the third English player under 21 to make Test debut in 2018 after Mason Crane and Dom Bess and the fourth one is his Surrey mate Olly Pope. Never before in 140 years before England handed Test caps to more than one player aged under 21 in the same calendar year. Stuart Broad completed his 3000+ Test runs as he became the fifth player to achieve the combo of both 3000 runs and 400 wickets in Tests. He became the first English cricketer to achieve this feat. He’s now eighth in the list of all-time leading Test wicket-takers levelling with legendary Sir Richard Hadlee and he now has 433 Test wickets to his name. In the fifth Test he had record 9th wicket partnership with Jos Buttler. The pair added 98 runs in only 122 balls to take England past the 300-run mark. This 98-run partnership between Buttler and Broad is England’s 2nd highest partnership in Test cricket for the 9th wicket against India. Its also the highest for the 9th wicket by any team against India in the last eight years. James Anderson became the first bowler in history to take 100 Test wickets at Lords. He is only the second bowler after Srilanka’s Muttiah Muralitharan to take 100 wickets at a single venue. He became the first England bowler since Ian Botham in 1980 to breach the 900 point mark in the ICC Test bowling rankings. He is now the most prolific wicket-taker among pace bowlers! He now has 564 Test wickets as he surpassed Glenn McGrath’s tally of 563 wickets. He achieved this feat when he got out Mohammed Shami on the final ball of the 5th Test! He is the also the 4th highest wicket-taker in this history of Test cricket. He now has got 110 Test wickets against India, which is the most by any player. He surpassed Srilanka Legend Muttiah Muralitharan who has got 105 wickets against the same opposition. Alastsir Cook got his 33rd Test hundred in his final international game i.e 161st Test match i.e in the 5th Test against India at the Oval. He went past Steve Waugh and stands at no. 10 in the list of most test centuries by any player. He now has scored most number of Test runs for England which are also the most by a Test – opener and he is now the highest scoring left-hander in Test history with 12,472 Test runs surpassing Srilanka’s legendary batsman Kumar Sangakkara’s tally of 12,400 Test runs. He is the fifth-highest Test runs-scorer in the history of Test cricket. Cooky has scored 13 hundreds in a 3rd innings of Test which is most by any player. He now has scored 7 Test hundreds against India, which is most by any English player. There are five players who have scored hundreds in both their debut and last tests. Other than Cook the list includes Reggie Duff, Bill Ponsford, Greg Chappell and Mohammad Azharuddin. Cooky has scored 2431 Test runs against India , only second to Ricky Ponting who has scored 2555. In the England 2nd innings in the fifth Test Cooky added 259 runs with Joe Root for the 3rd wicket in the 3rd innings of the match (5th Test), which is the highest partnership for any wicket in the match. It’s third-highest partnership involved in one’s last Test innings. He is the fourth on the list of batsmen involved in highest century partnerships in Test. Rahul Dravid, Sachin Tendulkar , Ricky Ponting and Mahela Jayawardene are the others in the list to achieve this feat. He became only the third Test player to pass 1,000+ runs at the Oval. Four years ago in 2014, Moeen Ali got his first Test five-fer against India in the 3rd Test at Southampton and this time in the 4th Test he got his 5th Test five-fer at the same venue against the same opposition! Mo was named as the Man of the Match in the 4th Test. In the 2nd Test at Lords Adil Rashid made a kind of bizzare record when he became just the 14th player and first Englishman in 13 years to complete a Test match without bowling, batting, taking a catch or effecting a run out. In the fifth Test he produced a shane Warne-like delivery to dismiss KL Rahul for 149 and that was the moment when the game turned in the favour of the hosts and eventually they won the fifth Test by 118 runs. That wicket was later named as the ‘ball of 21st century’ which reminded fans of Shane Warne’s Ball of the Century to Mike Gatting at Old Trafford in 1993. Adil Rashid’s ‘Ball of 21st Century’..
Keaton Jennings and Jonny Bairstow too produced not the big ones but crucial knocks whenever the team required the most along with the other players. Jonny Bairstow’s crucial fifty and that partnership with Chris Woakes has to be mentioned! Jamie Porter was added to the sqaud for the first Test and Surrey’s young lad Ollie Pope was called for the 2nd Test. Previous Previous post: YOUR TIME COMES WHEN IT COMES! Next Next post: ENGLAND V SRI LANKA ODI SERIES / ONE-OFF T20I STATISTICAL HIGHLIGHTS.